Dad has landed with a worm. Mama's a skillful architect, constructing a sturdy nest, while Dad's a champion turf defender. And those hatchlings! Such fluffs of plump perfection! 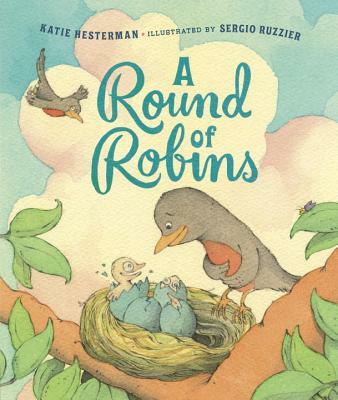 Katie Hesterman's vibrant verse celebrates this awesome circle of bird life, as we follow a pair of robin parents from nest-building and egg-laying, to raising their hungry hatchlings, and finally sending off their flying fledglings. Sergio Ruzzier's brilliant, candy-colored art pays tribute to all these stages of a robin's life cycle, reminding us that while robins may be common, they are also extraordinary! This is Katie Hesterman's debut picture book. She lives in Fort Wayne, Indiana. Sergio Ruzzier is a picture book author and illustrator whose work has received awards from American Illustration, the Society of Illustrators, Communication Arts, and the Society of Publication Designers. He won Parents' Choice Gold Medals for This Is Not a Picture Book, The Room of Wonders, and Why Mole Shouted, and he was a recipient of the 2011 Sendak Fellowship. He lives in Brooklyn, New York.